Watchman Monitoring finds problems before they find you. Let us help you keep a pulse on your customers' computers. Setup takes as little as 60 seconds! Start your Risk-Free Trial Today No credit card required. Grow your business and take even better care of your customers with Proactive Support from Watchman Monitoring. Streamline and organize the support you provide, and save time by fixing impending problems on your schedule. Turn the tables on IT Support. Reach out to your staff with solutions before they come to you with emergencies. Our customers have purchased prestige-level equipment and often spend more per month on iTunes than we charge to keep them up and running. This is the kind of product that really ties my customers to me and builds customer loyalty. We went from reactive break-fix work to proactive, scheduled, maintenance calls. This ensured maximum uptime and increased peace of mind for our customers. They couldn't be happier! You could be onsite with your clients everyday and still miss something that Watchman Monitoring will pick up on. For the backup monitoring alone, it’s worth the price. Watchman Monitoring has made us look like superstars to our clients as it identified some issues we would not have been notified about otherwise. John Pawelchak, Cohort Networks Inc.
We usually know if there's something wrong before the client does! 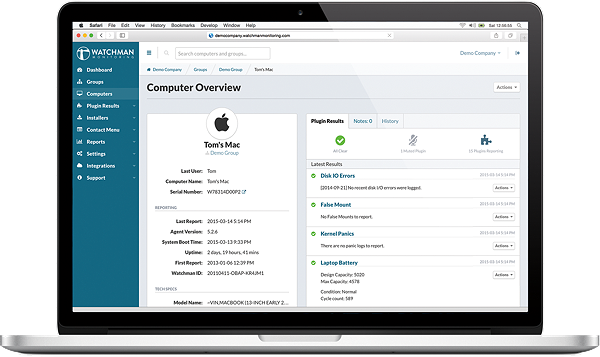 The tools are constantly evolving and we're evolving to take advantage of what Watchman offers us. A great product and service that always takes a 'whatever it takes to help' approach. I can't say enough good things about Watchman. I'm in a trial of Watchman Monitoring right now and I love it. Twice I found issues I didn't know about during the initial check-in! We use this to track all of our clients' computers. It notifies us of impending failures and so many other issues that it's a no brainer. Not only is my job easier with Watchman Monitoring, but it makes me look more professional when they call and I can immediately pull up their computer details. Foojee could not deliver our level of service without Watchman Monitoring. No other solution gives our clients this much value, costing so little, and is this easy to manage.